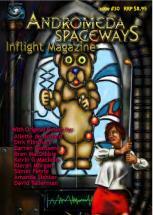 Issue #30 of Andromeda Spaceways Inflight Magazine kicks off with a flash piece by David Tallerman. The title, “My Friend Fishfinger, by Daisy, Age 7,” gives a good idea of the tone of the piece. Written in first person by seven-year-old Daisy, she tells of her new “bestest” friend in school, Samantha, whom everyone calls Fishfinger because she smells like a fish. Though Fishfinger’s family appears human, it’s rumored they are from under the sea and have gills. They worship the god, Dagon, which relates the tale to the Philistine myth. Daisy doesn’t like Fishfinger’s father, but accepts his offer to return with them to beneath the sea. The conclusion only hints at the horror to come, but it is a flash piece. "Autumn's Country" by Aliette de Bodard is the tale of a young Chinese bride about to journey to meet the groom picked for her. One interesting twist is that it is told from the point of view of Jun's brother, Fai. Had Fai know what would happen later, he would never have left her alone. "Mystery and sadness surround the death of their sister, on her journey to meet her husband several years before." The foreshadowing in the opening paragraphs was sufficient without that telegraphing sentence. But the two interesting plot twists that follow surprised me enough that I can overlook that. This story reflects Chinese culture and the mystery of the Yang-Tse River. And the female point of view is presented in a dramatic scene at the end. It neither eschews or accepts traditional practices, and no one wins. The third offering is another flash piece by Amanda Sichter. In “The Fairytale Cookbook,” Sichter deconstructs (or merely plays with) a few favorites by those “damned Brothers” to create a clever mix. I could tell you what they are, but since the tale is so short you should probably just read it for yourself. And I wouldn’t want to spoil it. At the end, there is a recipe for Grandma Hansen’s Gingerbread. Bake at your own risk! Kevin G. Maclean tells a traditional fantasy tale in “Fendraaken. When Fendraaken the dragon raises its ugly head, they send for our narrator, a seasoned dragonslayer. While this story gets off to a slow start, it was well written enough to use that as an asset to build tension and illuminate character. Nothing really fresh here, but a charming tale nonetheless. “Finding Each Other Again” by Kieran Morgan is a tale of reincarnation between two eternal lovers. Told from the POV of a journalist reporting this outlandish account, it’s really told in dual first person. In extended dialogue, Cassandra tells of her many lives with Maximus as they are always born minutes apart from each other, sometimes in different corners of the world, and spend their lives trying to reunite. This is Morgan’s first published story, and I found the tale’s length a little too long for its weight. In the defense of first published stories, compression of style is usually one of the latter techniques a beginning writer tackles. “Hare Redux” by Simon Petrie is a humorous retelling of Aesop’s fable, “The Tortoise and the Hare.” The Hare, ashamed of letting the Tortoise best him, demands a rematch, but the Tortoise is unwilling at first. Finally, a new race is scheduled with a few other contestants, consisting of talking animals and self-motivated toys—a true media event with camera crews and a TV broadcast. What makes this story, of course, is Petrie’s whimsical style. I won’t tell you who wins the race, but it’s not who you think. And the winner does reestablish the theme of the fable that “All any of us can do is our best.” How true. It’s highly unlikely that a revolutionary new kitchen blender could allow Stuart to play god in his kitchen, but when starting “Thyme Machine” by Darren Goossens, my suspension of disbelief was quickly put on hold as this is a fun story. Stuart has “borrowed” the Kitchen Molecular Reassembler from Breville, where he works, and creates a race of telepathic teddy bears who take over his house. What makes this story work is that Stuart is a devout Catholic who abhors evolution, but he is now...a god! This is a subgenre of SF stories that you don’t see as much of as you used to. Though basically a comedy, it has an outlandish pseudo-science premise that’s treated dramatically, yet plausible scientific explanation is never forthcoming. You still see these types stories pop up in the prozines, and though they never win (nor should they) any awards, they’re a staple of the genre. This one left me with a smile. In “Collecting Whispers,” Bren MacDibble tells of Ramla the seer who talks to the deities in caves. But when the Pharaoh requires her skills to foretell the future, she finds herself in a dilemma that most likely means her death, one way or the other. The characters are well drawn and the plotting good. The twist at the end makes this short tale especially well crafted. “Truckers” by Dirk Flinthart concerns an American Down Under in the outback town of Nugga Nugga. Our narrator sees a green light in the sky and is convinced that the local residents are trying to pull a UFO hoax on him. He’s been the brunt of many jokes in the past. But of course, there’s more to it than that. This story reminds me of Lawrence Watt-Evans’s Hugo-winning short story “Why I Left Harry’s All-Night Hamburgers.” Not a bad thing to be compared to, as I felt the same warmth at the end.